In mid-May I was called for jury duty for the third time in my life. This time, it was at 111 Centre Street, which looks like a normal office building with extra security. I showed up half an hour early, and had to wait 10-15 minutes to get through security before being able to head up to the jury room. Once in the jury room, we had to watch an orientation video that seemed to be produced in the early 90s but had contemporary information, and submit some forms including parts of our jury summonses. We were told the rules, and then the fun started. While filling out the forms, at about 10 a.m., a court officer came in to pick up jurors. The person in charge of the jury room mentioned that he wasn’t expected until 10:30 a.m., so he sat and waited. About 10 minutes later, her phone rang and she said something like, “You need 75? OK, give me a few.” She then announced that she would be calling names and if your name was called, to yell out and go out to the hall to be lead to a courtroom. I was probably the thirty-fifth person called, so I yelled and waited in the hall, like I was told. After a whole bunch of other names were called, the court officer told us to go to the 12th floor and wait for him in the hallway. Once up there, we were lead into a courtroom, and told some general information about the trial. We were then asked if we knew any of the witnesses expected to testify and given their names. We were then asked to fill out a short information sheet, which asked such things like place of employment, if we or family members were convicted of a crime, if we or family members were victims of a crime, and hobbies. After giving everyone a moment to fill out the forms, the judge announced that the court clerk would start calling out names, and that we would go and sit with the judge and lawyers and go over the form. I was the ninth person called. The judge looked over the form, asked a few questions about my employer, asked if I knew anyone who’s in law enforcement or a lawyer, and when I answered in the affirmative, he asked if I would talk to them about details of the case if I were a juror. After the quick questions were over, he told me to sit in the juror box and wait for the first group of 12 to be picked. After four more were found, it was time for the void dire process to begin. The prosecution’s lawyer asked some general questions to everyone such as, “Does anyone have any issues if we present medical evidence?” Someone raised their hand, the lawyer asked them some direct questions about the details, and then went back to more general questions, such as, “Does anyone have a problem believing a witness if they are forced to testify by subpoena?” They also asked more pointed questions to a specific juror such as, “Mr. Madison, do you feel you could convict someone even if there was no DNA evidence to tie them to the crime?” While all the questions were going on, the lawyers on both sides would scribble notes on their pads. After about 15 minutes for both prosecution and defense, the void dire process was over, and we were told to wait in the hall. After about 15 minutes, the court officer read about six names out, mine included, and told us to go back into the courtroom, while everyone else could go to lunch. In the courtroom, we were told we were picked for the jury, sworn in, and then told to go to lunch and to be back around 2:15 p.m.
After a nice long walk around SoHo, I went back to the courthouse and had to wait about 30 minutes to get through security. Once upstairs, we were taken to the jury room by the court officer, told to be back the next day at 10:15 a.m., and given a yellow card which signified we were on a jury and gave us the ability to skip to the front of the security line, which would have been nice to have had before lunch. I won’t go into specifics, but generally speaking, we were told to be there around 10 a.m. in the morning. We would wait in the hallway and read/listen to headphones/etc. until the court officer picked us up and brought us to the jury room. Usually we would sit in there for 15 minutes or so until the court was ready for us. Once in the courtroom, pads and pens were provided and we were not to take them out of the courtroom until deliberations. We would listen to testimony until around 12:30-1 p.m., at which point we would take lunch and told to be back at 2:15 p.m., at which point we would repeat the morning process until around 4-4:30 p.m. when we were let go for the evening. Some days we would have a longer wait before going into the courtroom due to legal stuff happening that we were not to see. Other days, we would sit and see one witness before going back into the jury room while more court business went on. I got a lot of reading done. Basically finished the bulk of The Caped Crusade: Batman and the Rise of Nerd Culture, and made a nice dent in Alexander Hamilton. While we were in the courtroom, the trial was similar to what you see on TV, just less scripted. Witnesses were nervous and would either answer questions which they weren’t asked, or would answer with the obviously wrong answer, and the lawyers would have to reask the question or would offer to show them information to “refresh” their memory. Often times the court reporter would have to ask the witness to repeat certain words or spell out certain words. This happened mostly with technical testimony from a doctor or a forensic accountant who both used big words and talked quickly. There was lots of technical testimony to tie certain evidence to the crime, and if there were 11 items of the same thing found at the crime scene, they had to ask about each of the items separately. There was also lots of testimony related to chain-of-custody, which, while necessary, was quite boring. Like the last two times I had jury duty, I got several long lunch breaks, and because it was early Summer, I took advantage of them. One day I walked around lower Manhattan as far down as Battery Park and back up around Federal Hall, and even walked by the Museum of American Finance (which I had just learned existed a few weeks earlier). 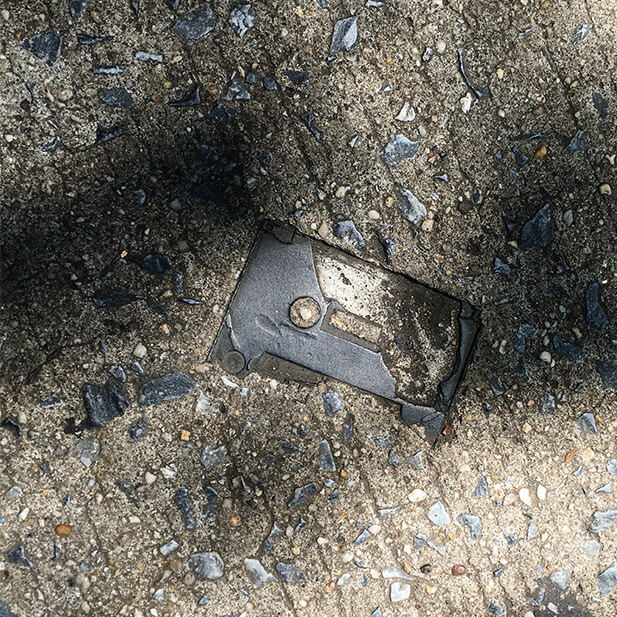 Another day, I walked over to the Lower East Side to see if a certain cassette tape was still stuck in concrete. It was. But the best was the day we had over two hours for lunch, so I walked across the Brooklyn Bridge and had a lobster roll while enjoying the view. The jury room was exactly like you see on TV. The room was just big enough to hold the table and chairs, with a little extra so people could walk behind the chairs if others were in them. It had a coat rack, which had some small containers of condiments on the top of, a water fountain, and two bathrooms…one for men and one for women. I thought this was a little odd since they both had one toilet in them, so what was the need for separate rooms, but, whatever. The problem with the bathrooms right off the jury room was that there was no sound protection. At one point, one of the men went into the mens room, closed the door, and then we all heard a Disney movie soundtrack playing from his phone. That was interrupted several times by the sounds of a very vigorous evacuating of the bowels, including many grunts and groans, and everyone in the jury room had to be subjected to it. I tried to remain as mature as possible, but it was tough. Deliberations were exactly like you see it on TV. We got to use the notes we took during the trial, we got to ask for testimony read back, and we took a few votes before coming up with a verdict. Once it was over, we were thanked by the judge, and escorted from the building. In the end, it was very interesting to see how an actual trial worked. It was also nice to get long lunches without worrying about any work to do.